One of founding members of the South African Students' Organisation, and an important figure in the Black Consciousness Movement with Steve Biko, and an exponent of Black theology. His more recent work in human rights has been widely recognized. Professor Nyameko Barney Pityana was born in Uitenhage on 7 August 1945. He attended University of Fort Hare. He received a law degree from the University of South Africa in 1976 but was barred from practicing law in Port Elizabeth by the apartheid government. He is a lawyer and theologian and he is active in human rights. Pityana was one of founding members of the South African Students' Organisation, and an important figure in the Black Consciousness Movement with Steve Biko, and an exponent of Black theology. He was a member of the African National Congress Youth League, and was even suspended for repeatedly challenging the authority of the Afrikaans teachers and the "principles of Bantu education". He went into exile in 1978 and studied at King's College London and Ripon College Cuddesdon in Oxford. He studied law and Anglican ministry. He returned to South Africa in 1993 and continued working in theology and human rights. He was appointed a member of the South African Human Rights Commission in 1995, and elected chair on 2 October of that year. 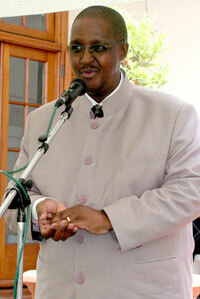 He also served on the African Commission on Human and Peoples' Rights at the Organization of African Unity in 1997. His work in human rights has been widely recognized, and in December 2002, he was awarded an Honourable Mention of the 2002 UNESCO Prize for Human Rights Education. Prof N Barney Pityana has been Principal and Vice Chancellor of the University of South Africa in the City of Tshwane, South Africa since 2001 and was recently re-appointed as Principal and Vice Chancellor for another term, until 2010.